If there ever was a song best paired with a dessert there’s only one that can be attributed to this little concoction – that very memorable and unforgettable instantly up-lifting little 80’s ditty by Dave Dobbyn. No doubt some people would find the song irritating but the same cannot be said about this divine combination of frozen Kiwi Fruit and Chocolate. And when you bite into this delectable creation, if ‘Heaven’ is the so-called place where only good things happen, this is promptly where you will find yourself along with wanting more of course. We’ve been putting strawberries and chocolate together and fonduing since the Ice-Age but Kiwi Fruit and frozen at that takes the tried and tested fruit-chocolate combo to a new dimension as the moon shines over your horizon. 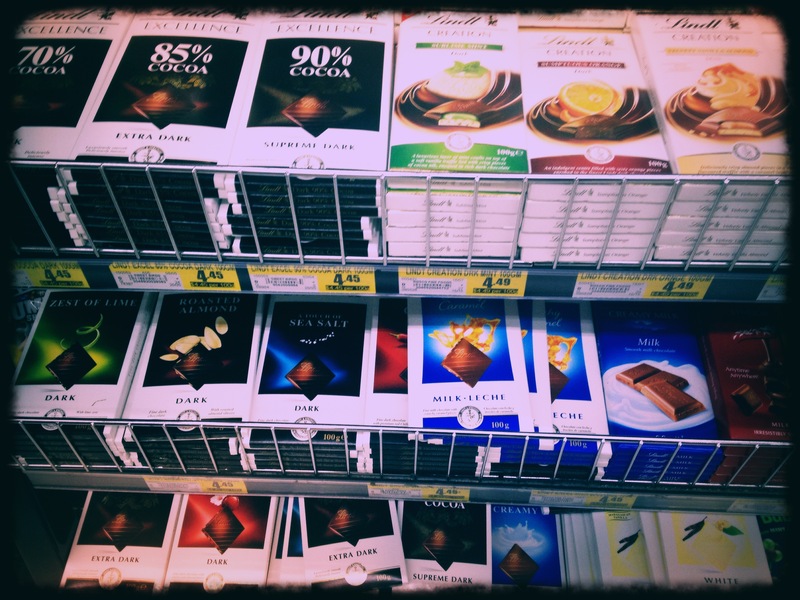 Is it my imagination or is anyone else noticing the abundance of Lindt Chocolate cutting us off at the path every turn of the trolley during food shopping expeditions? I always thought Harris Farm was primarily a fruit and veg marketplace. I realise other items besides produce have been appearing on their shelves for some time now but the special that hit me square in the face upon entering the store last week was three one hundred gram blocks of Lindt Chocolate for five dollars. Contrary to my local IGA selling them for a weekly ‘special’ of three dollars forty-nine cents per one hundred grams, the Harris Farm deal looked like a true bargain. I only needed some continental parsley and a bunch of eschalots, but my basket now had blocks of exotic sea-salt, chilli, coconut and zest of lime sensations thrown in as well. It’s only a matter of time before Lindt takes over the world as we know it. Even dearer in North Sydney CBD…. Wrappings can be torn off and the chocolate consumed in that state immediately which of course is what is intended by the manufacturer but I like to experiment and find other ways with chocolate other than an instant fix. The Texans invented a Chocolate Chilli Con Carne and Nigella Lawson (the unsurpassed Chocolate Queen) uses it in her recipe too. Yes, it’s generic dark cooking chocolate they use rather than luxurious Lindt, but I never had a problem eating dark cooking chocolate straight from the packet either finding it perfectly edible. I struggle to find a reason why Lindt’s Sea Salt variety wouldn’t also work in the Con Carne. If you can muster the strength and resist temptation to eat all the chocolate before you melt it for ‘Slice Of Heaven’ you’re doing well. Afterall you’ll be eating it eventually so it’s a healthy will-power exercise. 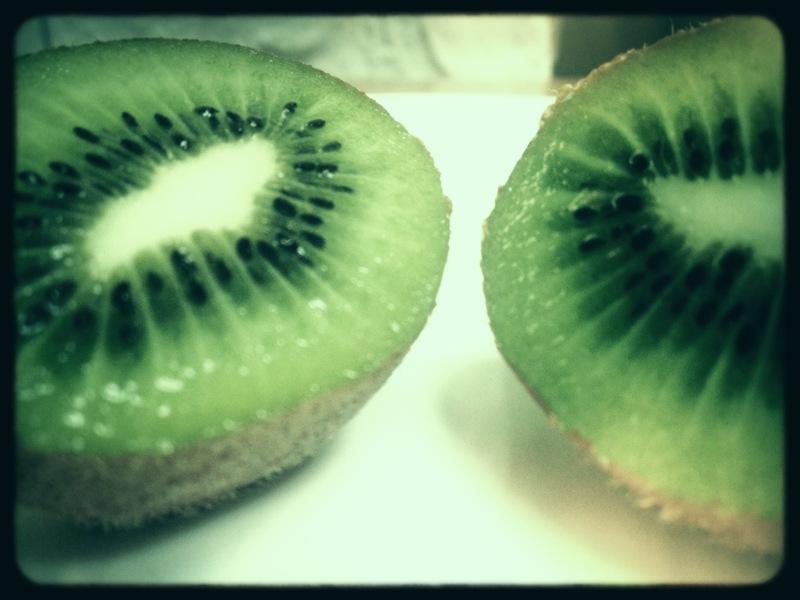 With the knowledge you’ll also be rewarding yourself with a good Vitamin C dose from the Kiwi Fruit the guilt from chocolate consumption is a minor consideration. And kids love this, even the ones who are defiantly fruit-intolerant. Here-in probably lies the original reason fruit started being smothered in chocolate in the first place. Would it work the same with a member of the Brassica family I wonder, ‘Choccoli’ anyone? 2) Melt chocolate and coconut oil in a bowl over a saucepan of simmering water. Take off heat and bring to room temperature. 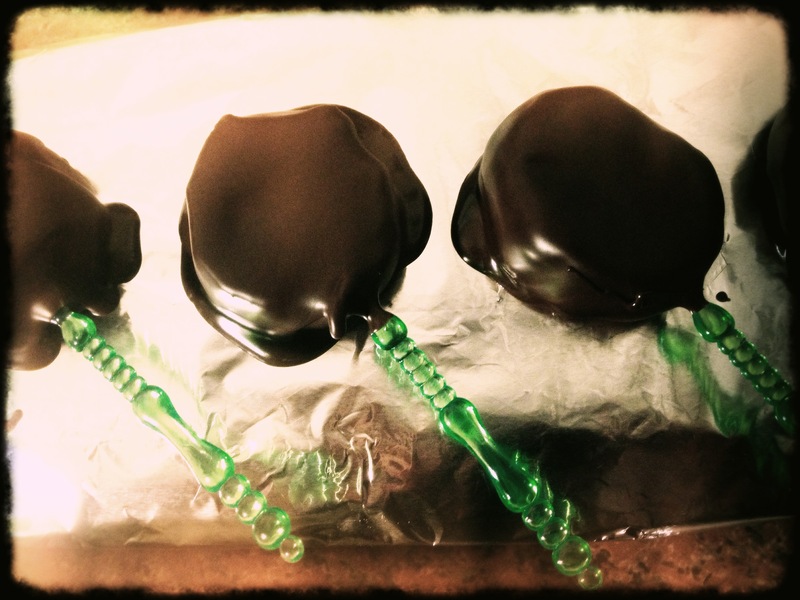 3) Remove Kiwi slices from freezer and spoon melted chocolate over each making sure they are covered evenly. 5) Repeat steps 2, 3 and 4 for a decadent double coat. * The inspiration for this recipe can be found here.